I know that Hollie has only been at Nursery since May but I soon got used to having a bit of time to myself and now that there is only one week before the summer holidays I am really trying to think of things to keep her occupied. I have a few ideas and I am sure that I will post some of them on the blog. 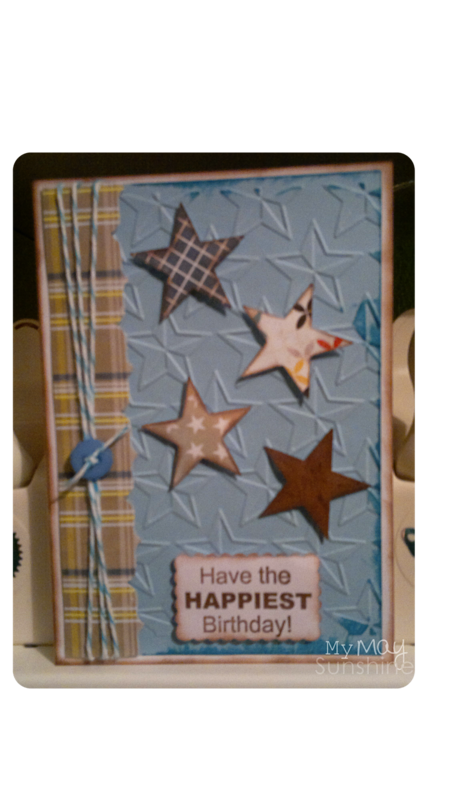 In the meanwhile I have a card to show you that I made for a friend’s birthday. Paper: Making Memories Just Chillin Boy, Basic Grey Max and Whiskers. Stamp: My Pink Stamper Fabulous Sayings. Ink: Brown – Versamagic and blue- Distress ink Broken China. I recently decided to buy a set of My Pink Stamper stamps as I wanted some more sentiment stamps and they fitted the kind of sentiments I wanted. I have to say that the quality is good and they stamp really well. I can see myself buying more in the future. Previous Post Adding a favicon in blogger. My May Sunshine is a lifestyle and crafting blog. I'm a Stampin' Up! demonstrator and an Independent Consultant for Neal's Yard Remedies Organic.